Cadence is a musical term of Italian origin meaning modulation, inflection rhythm, or the closing sequence of a musical phrase. The term, relative to horses, refers to the animal's natural rhythm made by its hooves when it's walking, trotting or galloping.Cadance's full title is Princess Mi Amore Cadenza, mi amore cadenza being Italian for my love cadence. Cadence's cutie mark, a crystal heart, is sometimes depicted with a single mirror-like facet at its center, and sometimes with multiple facets around its center. Her cutie mark bears a strong resemblance to the Crystal Heart. When she holds the crystal heart, her cutie mark glows as if surrounded by her magic. 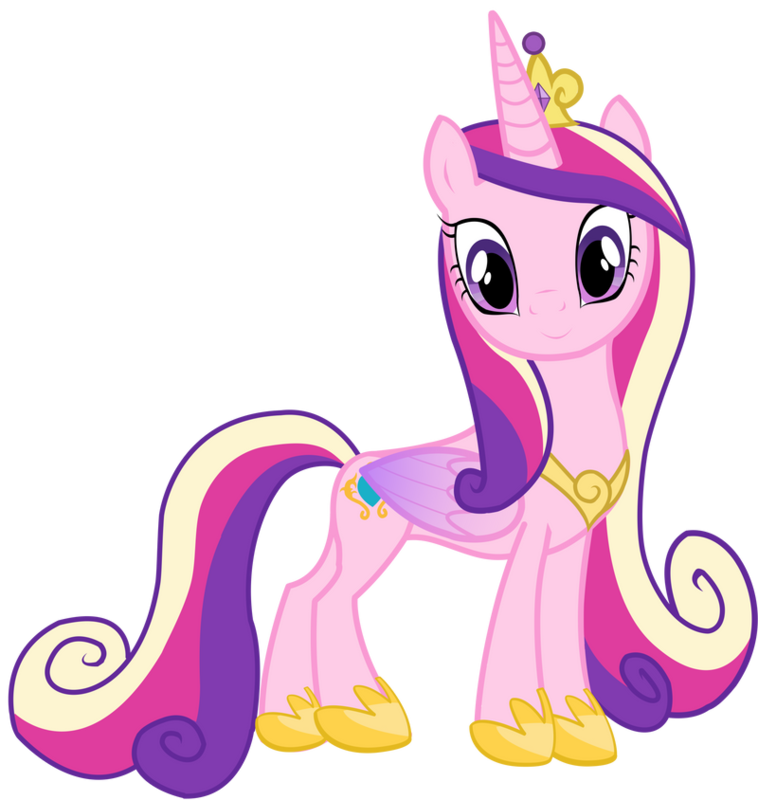 Princess Cadence's special talent is one based around the power of love. It perhaps isn't the strongest of talents, but she is able to use it to mend broken hearts, or to help and bring happiness to those in need. She is tender and kind, and only wishes the best for everypony around her. She also know basic and high level unicorn magic like levitation and telepotation. She can recharge the crystal heart and keep the crystal empire alive and well. She also possesses the Element of Love in the New Elements of Harmony. Cadence is a kind and caring soul who goes out of her way to help those in need around her as best she can. She has a deep love for her family, and great loyalty for her friends. She is an avid foalsitter, and adores taking care of children. It has been said she can have a playful and teasing streak at times, which helps when taking care of little colts and fillies. Though perhaps more relaxed and not as formal as she should be, she does know when to be serious and formal when the need arises. Princess Mi Amore Cadenza is the niece of both Princess Luna and Princess Celestia, and a close cousin to Prince Blueblood. Growing up in Canterlot, she was the special foal-sitter of a wonderful little ball of book-reading known as Twilight Sparkle, whom she quickly became friends with. That is where she met her future husband-to-be, Shining Armor. She tends to shorten her name to "Cadence" for those about her. Cadance is first mentioned by Twilight Sparkle when Twilight reads aloud the wedding invitation sent to her from Princess Celestia. Twilight is invited to "the wedding of Princess Mi Amore Cadenza and... Twilight's brother", Shining Armor. Twilight immediately resents the situation for not being told about it personally by her brother, and doesn't recognize the name "Princess Mi Amore Cadenza". When Twilight gets to Canterlot and confronts her brother about the wedding, he tells her that Princess Mi Amore Cadenza is Cadance, her old foalsitter, and Twilight gleefully calls her "the greatest foalsitter in all the history of foalsitters" then goes on to praise her as "beautiful", "caring", and "kind" in her voice-over of a flashback of her childhood where she is foal-sat by Cadance. A younger Princess Cadance foal-sitting Twilight, doing their special hoof-shake, in the flashback. Cadance, as Twilight describes, is caring and kind in the flashback. It kind of shows her as fun-loving. She greets Twilight with a hug, bandages her and wipes her tears when she's hurt, plays with her on a swing-set, tells Twilight she feels lucky to be her foal-sitter, and does a little song-and-dance with her. Twilight's voice-over says Cadance spreads love wherever she goes, while a brief scene shows Cadance casting a spell that quells an argument between two ponies. Twilight mentions in the flashback that Cadance is a princess. "Princess Cadance" arrives but unbeknownst to Twilight Sparkle, this "Cadance" is actually Queen Chrysalis in disguise. Immediately after the flashback, Cadance joins Twilight and Shining Armor. Twilight enthusiastically greets her with the song-and-dance from the flashback, but Cadance coldly rebuffs her. Cadance raises Twilight's suspicions with her "demanding", "totally insincere", and "rude" behavior, as she tells her friends. She tries to broach the subject to Shining Armor, but Cadance interrupts before they have a chance to talk and takes Shining Armor into another room. Twilight, peeking through the door, sees Cadance casting a spell on Shining Armor, and concludes that she's "downright evil" then runs off. Twilight then confronts Cadance at the wedding rehearsal, in front of Princess Celestia and the rest of the attendants, which makes Cadance run away from the rehearsal in distress. Shining Armor explains that the spell Cadance used on him is meant to ease his headaches, and excuses Cadance's behavior as stress from the wedding preparations. Rebuked, Twilight is left alone to regret her accusation and strained relations with her brother in a short reprise of the song B.B.B.F.F. Cadance returns and trods on a toy-like image of Twilight from the song sequence; Cadance at first looks down compassionately at Twilight, but then her eyes shine green, her face becomes cruel and she encircles Twilight in green flames, which pull her into the ground as the scene fades to black and the episode ends. Underground, in "the caves beneath Canterlot", the imposter Cadance taunts Twilight through apparitions in the caves' crystals. She tells Twilight that the caves are the ideal place to keep those who try to interfere with her plans. Twilight attacks the apparitions with blasts of magical energy from her horn, and eventually breaks open a passage to find a scuffed and scared Cadance who almost immediately recognizes Twilight and tells her she's been imprisoned by the impostor Cadance. She does the song-and-dance from Twilight's flashback, proving her identity, and the two ponies warmly hug. Cadance and her impostor share a song sequence, This Day Aria, with Cadance and Twilight making their way out of the caves while the impostor prepares for the wedding and begins the wedding ceremony. After the song, Twilight and Cadance are confronted by the three former bridesmaids Lyra, Minuette and Twinkleshine, who block their way out of the caves. The scene cuts to the impostor and Shining Armor almost completing their wedding ceremony, when Twilight and Cadance interrupt the wedding, and a brief flashback shows Cadance throwing a small bouquet to distract the bridesmaids. Cadance declares that the impostor is a changeling, and the impostor reveals herself as queen of the changelings, who is named Queen Chrysalis in the episode's script but not on-screen. Cadance charges the queen, but backs off when the queen threatens to send her back to the caves. Princess Celestia tries to overpower the queen with her magic, but is defeated, surprising everyone, including the Changeling Queen. Celestia sends Twilight and her friends to get the Elements of Harmony, but they are captured by the Changeling Queen's minions and brought back to the wedding hall, where Celestia is imprisoned in a cocoon and Cadance's hooves are glued to the floor. Shining Armor and Princess Cadance use a spell with the Power of Love. Twilight takes the opportunity, when the queen is preoccupied, to free Cadance so she can reunite with Shining Armor, and her magic snaps him out of his trance. Shining Armor tries to perform a spell to repel the changelings, but he doesn't have the strength to repel them. Cadance tells Shining Armor that her love will give him strength, and their magic spreads outward and repels all the changelings and their queen off into the horizon. Twilight and her friends help Cadance put together her wedding, with arrangements meeting her enthusiastic approval, and Shining Armor jokes that Cadance agreed to marry him after he told her she'd be gaining Twilight as her sister. At the wedding, Celestia proclaims that the power of Cadance and Shining Armor's love is undeniable, and pronounces them "mare and colt". The couple look onto the castle courtyard and wave to the cheering crowds, then kiss. After a wedding reception montage, Cadance and Shining Armor enter their chariot and Cadance tosses a bouquet, which Rarity violently catches. The happy couple then ride off into the night, presumably going on their honeymoon. Cadance is exhausted by the need to constantly maintain the magical barrier around the Crystal Empire. When Twilight Sparkle and her friends arrive at the Crystal Empire to help Shining Armor and Princess Cadance protect the empire from King Sombra, they find Cadance in the throne room overlooking the empire. She is using her magic to power a protective barrier to fend off King Sombra, and looks haggard and weary. However, at the sight of Twilight, her close friend, she eagerly runs to her and recites their childhood chant. She tells Twilight that one day they should get together when the "fate of Equestria isn't hanging in the balance". Shining Armor explains to the ponies that Cadance hasn't slept and barely eats because she must constantly use her magic to "spread love and light" and defend the empire. She cannot go on like that forever, so Twilight Sparkle and her friends must find another way to protect the empire. They set up a Crystal Faire to help the Crystal Ponies recall their rich history and culture, and all seems to be going well until the friends realize that the heart-shaped crystal serving as the centerpiece of the Faire is supposed to be a genuine artifact called the Crystal Heart. When Twilight notifies the royal couple of this disheartening discovery, Cadance reassures Twilight but suddenly collapses in Shining Armor's arms, gasping for air. Holes start appearing in the magical shield, and King Sombra's black smoke billows into the vulnerable empire. As Sombra advances ever nearer to the empire's center, Shining Armor supports Cadance and exchanges a tender glance with her. She straightens up and recreates the magical shield, blocking Sombra's advance and slicing off the tip of his horn. This close call reminds the other ponies that they must find and restore the real Crystal Heart. As Sombra launches his second invasion, Twilight and Spike eventually locate the Crystal Heart at the top of the castle's central tower, but Sombra sees their progress and traps Twilight in a encirclement of crystals. Spike begins the long descent down the tower, precariously holding the heart, when Sombra charges right at him. Yay!! thanks!! I'll have my Celestia Bio up in a moment too!